Dining tables are a popular focal point for home entertainment. They come in a variety of shapes and sizes to compliment your décor. Our collection of dining room tables include round, rectangle and square dining tables that suit a more casual or contemporary style. Choose from wood or glass table tops with a natural or painted finish. To bring a pop of color to your dining room table, consider our festive table linens! Round TablePacific Home Furniture’s Adam Table is a beautiful table for your dining room. 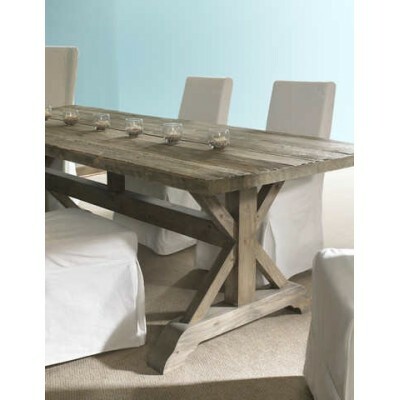 ..
Bamboo Stick Dining Table-Naturally rustic and eco-friendly, this table from Pacific Home Furnit..
Reclaimed Teak Wood Dining Table Enjoy the casual styling and warm, robust feel of.. Round Dining Table In Recycled Teak Wood Contrasting Warm Reclaimed Teak wood and cold ..
Coastal Cottage Collection....This Farm Table from Pacific Home Furniture is amazing addition fo..
TableThis Legare Table from Pacific Home Furniture is an amazing table for your home.Sing.. Round TableThis Round Dining Table from Pacific Home Furniture is an amazing table for your home..
Artisan Crafted Reclaimed Round Wood Dining TableThis beautiful round dining table is ..
Artisan Crafted Reclaimed Wood Dining TableThis dining table is artisan crafted with meticu.. Dining Table Pacific Home Furniture’s San Francisco Dining Table is sure to brigh..
Sheldon TablePacific Home Furniture’s Sheldon Table is sure to brighten up any room!.. Tiffany TablePacific Home Furniture’s Tiffany Table is the table for sure to brighten up a..